This week on Glee (Season 3, Episode 14), the kids deal with a suicide attempt and car crash. Read Kidzworld’s recap of “On My Way”, which aired February 21, 2012, to find out what you missed! Tonight’s episode of Glee opened on a rather somber note. Someone outs Karofsky by writing “fag” on his gym locker. Although he has bullied many people in the past – including Kurt for being gay – he can’t handle it himself and tries take his own life. His dad walks in just in time to save him, but everyone is still shocked and upset. Mr. Schu talks to New Directions about suicide, and asks them to think about all of the positive things they are looking forward to in the future. This week was also the Regionals competition, which determines who gets to go on to Nationals. The Warblers and New Directions are in a full blown war, and Sebastian even threatens to post naked pictures of Finn online if Rachel doesn’t drop out of the competition. But, Karofsky’s suicide attempt makes everyone realize how ridiculous they are being. Both clubs make strong performances, but Rachel’s solo steals the show and guarantees New Directions a win. 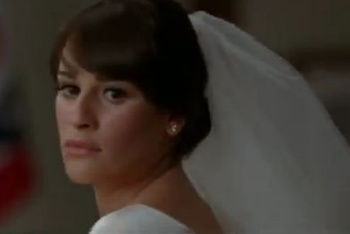 Rachel takes Mr. Schu’s “seize the day” advice to heart, and tells Finn she wants to get married right away instead of waiting. While everyone is a bit hesitant, no one does anything to stop them. They all head down to the local courthouse, but Quinn is late. Quinn is in her car running late, so she grabs her phone to text Rachel. Just as she finishes her message, she gets hit by a car. Will she survive? Can you wait until April to see the rest of Season 3? Let us know what you think will happen to Quinn.